I would basically describe these potatoes as a mashed potato encased in a crispy, ranch flavored outer shell that will explode in your mouth with the force not unlike a cool ranch Dorito chip. Now we don't eat Dorito's in our house, (not at all saying I'm immune to the deliciousness of a Dorito, just merely trying to keep our house free of processed foods) but we definitely like to eat a crispy, ranch-y potato now and then. I've been making this roasted potato recipe for a while now, which is NOT AT ALL like a regular old roasted potato. Boiling the potato first so it gets all soft and then baking it in vegetable oil and corn starch creates a magical effect that is probably a little unhealthy, but unhealthy in a way that is crispy and divine thereby making it totally worth it. Adding in the ranch seasoning has taken the recipe to a whole new level. A level that is definitely going to make everyone freak out the next time I make them for a dinner party, which, duh..., is the goal of my entire life. 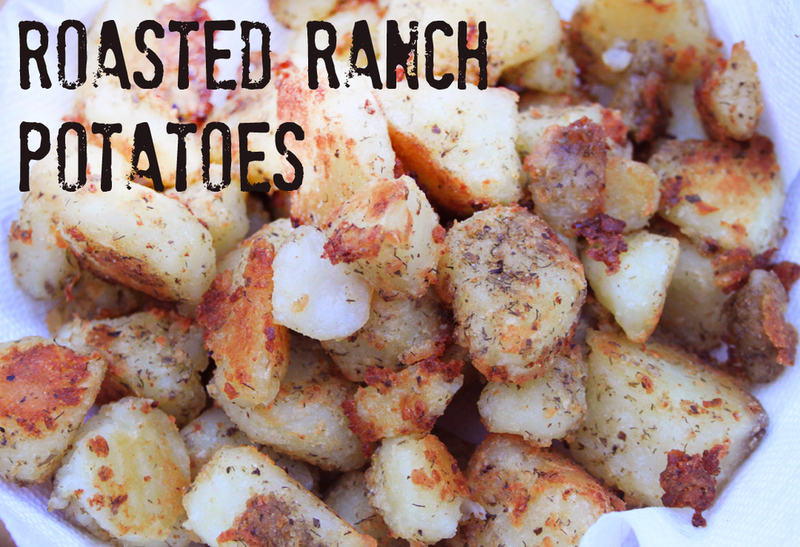 * You can also use store bought ranch seasoning if you want to skip making your own seasoning. Preheat oven to 425°. Place the peeled and cubed potatoes in a pot of water so that the water covers the potatoes. Boil the potatoes until they are fork tender. Drain the potatoes in a colander and leave them in the colander for the next steps. Sprinkle the corn starch and ranch seasoning on them and toss them about so they are evenly coated with the starch and seasoning and they get roughed up a little. Pour 2-3 tablespoons of vegetable or canola oil onto a baking sheet so that the oil is just covering the bottom of the pan and place into the hot oven. Remove the sheet from the oven after about 3-4 minutes or until the oil is hot. Pour the potatoes out onto the baking sheet and shake the baking sheet so they are evenly covering the pan. Spray the tops of the potatoes with the spray oil. Bake for 15 minutes, turn them over and bake for an additional 15 minutes. The potatoes should be golden brown. If they aren't golden brown, continue to bake, turning them every couple of minutes until they are done. Place onto paper towel to drain excess oil and allow to cool for a few minutes before serving.